Oh wondrous world! Oh peaceful place! Greetings from the Fort Mason District my fellow 50-year old Earthlings, my younger brethren, and the not so much. It's been a while since my last post but rest assured in the last month the El Niño rains of 2010 continue, as do my coastal jaunts. 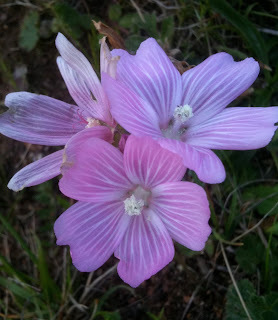 Our most recent circumnavigation of Hill 88 in the Marin Headlands was Sunday March 7th under sunny, breezy skies, and I am thrilled to report that the annual parade of wildflowers has begun in earnest. A collection of pictures will follow anon, but first let's have a little trip down memory lane. One might think that I've been dabbling in the poetic arts recently, but the above actually debuted on January 1, 2001. You see some dear friends of mine (a married couple, even) had birthed their first boy-child not long before, so naturally we had to stage a somewhat unorthodox seaside baptism before the ceremony at the family's neighborhood Lutheran church. Nothing too Salem's Lot, mind you, but by "somewhat unorthodox" I mean we placed the swaddled, gurgling infant on a picnic table at Steep Ravine, held hands and witnessed "the burning of the sage" to secure a sacred, circular space. We read incantations and a short piece by John Muir, listened to blessings from Aunt Lori; we heard Uncle Pete's poem and a word or two from the mother and father. We also heard that one set of grandma and grandpa were, shall we say, a wee bit concerned (read: less than thrilled) when they learned of the pagan-ish memorial. We had tried to keep the goings-on to ourselves, but the cat somehow leapt out of the bag. The sunset ceremony was followed by a splendid night in the cabins and a feast of kingly proportions: Dungeness crab and artichoke gratin; Katie's Smokehouse salmon shmear; oven-roasted pork loin crusted with green peppercorns, served with whole-grain mustard aioli; Southern black-eyed peas and bacon; wilted Savoy spinach; jalapeño cornbread; and Grandma Greenwood's spice cake for dessert. We washed it all down with Selbach-Oster riesling from the Mosel, Vieux Télégraphe Chȃteauneuf-du-Pȃpe blanc, Domaine de l'Hortus Pic Saint Loup rouge and Ridge Geyserville from Sonoma County. I remember the weather for our 24-hour stay was classic California, break-between-the-storms winter fare: crystal clear, piercingly blue skies, with warm in the sun/cool in the shade temps. The mighty Pacific Ocean sparkled beneath the cliffs and sent long, lazy, beautifully formed swells and rollers toward shore. I remember the peach-colored half moon that night, dropping toward the sea like a big, succulent tangerine segment; when the curved edge broke the horizon it seemed to pause and float upon the water like a Puss 'n Boots boat to dreamland. I remember the morning after I sat outside with coffee in hand and watched, like I am want to do, just watched the ocean. When they crested, the top edge of the incoming waves would dissolve in the breeze as fine, misty sea-spray and capture the rising sunlight in ethereal, fleeting rainbows. It was mesmerizing. I remember that, as usual, it was a lovely stay seaside at Steep Ravine, made even more magical by the rare gathering of so many friends (we had 2 or 3 of the 10 cabins, I think), by the pristine weather, by the joyous feast and by the unusual yet heartfelt baptism. So with Daylight Savings Time ticking into play this weekend and with the vernal equinox just around the corner, I thought it appropriate to revisit the verse. I hope you enjoyed the read, and I hope you'll agree that the words speak not only to that specific point in time almost a decade ago but also of the Earth's yearly baptism/rebirth in my/your/our neck of the woods after the big winter thaw. For most of the frozen continent "April showers bring May flowers", but on the northern California coast so do December, January, February and March showers. Now let's get to some damn flowers! 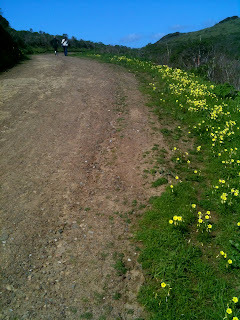 The following pictures were taken in the Marin Headlands on March 7, 2010 with The Little iPhone That Could. I know I wrote that, based on earlier attempts, I didn't think it was gonna cut the mustard; that I would have to break out the Canon EOS Rebel, but I've found that if I get up nice and close to the subject or block the direct sunlight with my shadow the results are...well, scroll on! This is the first sign of color in the coastal hills come February. I tried to photograph them this year on previous hikes to no avail, but this one turned out well. They are low-to-the-ground mats with spiky-leaves; they love grassland and sun, and to me look a bit prehistoric. Ahhh, yes. 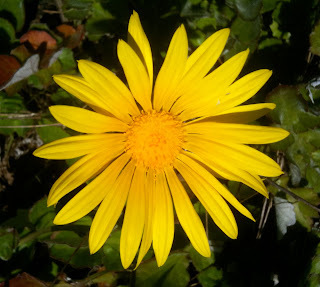 One could not ask for a more electrifying state flower, nor one that seems so well adapted to life on the coast. Prefers grassland and the sun, lots of it, and will recoil at night or if the clouds move in. 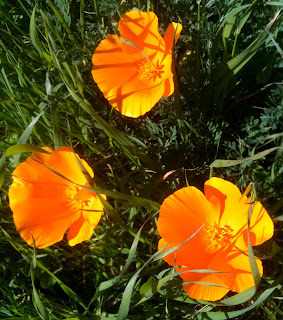 PS - A rare, all-yellow sub-species (or yellow and orange together) blooms on Point Reyes National Seashore in north-western Marin County (which we'll get to later). Poppies on the Coast Trail. Well, I thought this was a mule-ear; now I'm not so sure, as there's a couple of flowers on the trail that resemble this one. More information later. See this is what I'm talkin' about: look at the detail! Pretty good for a (not even) point and shoot camera. Delicate, delightful and if I remember correctly decidedly early this year. 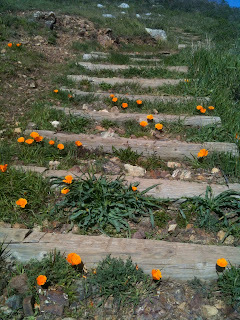 Teeming on the Wolf Ridge Trail last weekend, but they're already starting to wither en masse. 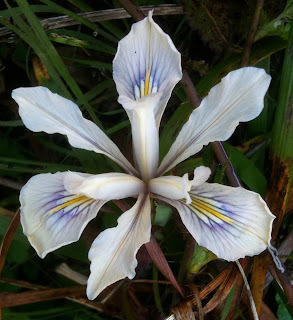 This specimen is pale, as you can see, but they're found in a variety of shades, including a much darker blue/violet. Bermuda Buttercups, I think. But so pretty, I know. Hmmm...more later. 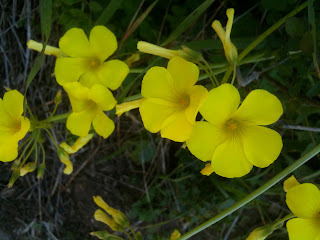 Bermuda Buttercups lining the Miwok Trail. Damn...and I thought fish was confusing! 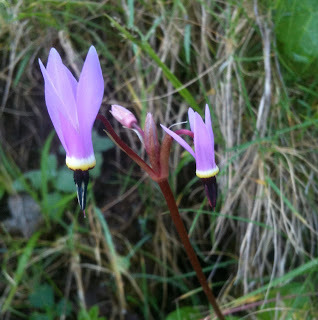 Found on rocky, north-facing slopes, this is a close up of the bloom at the top of a long bare stem. More later. So pretty, so delicate. 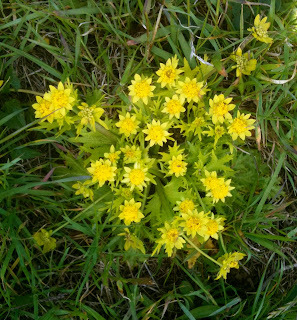 Blooms early in the season and also prefers rocky, north-facing slopes.